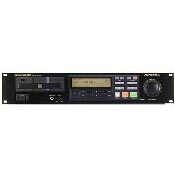 The PMD331 is a high performance CD player designed for professional applications and heavy usage. It leads the market with CD-RW disc compatibility and the ability to display CD-Text track and disc information. Featuring XLR outputs and a jog wheel for frame-accurate searching or pitch control (+/-12%), the PMD331 provides outstanding control over CD playback, from A-B looping to cue from index, auto-cue and instant start. Very Good live sound from it. Superb clarity and micro resolution in a quite passages.